Replacing SQL by Neo4j in a new release of project management tool simplifies business logic, adds time-dependent data management, and gives room for new features like connections-in-time thanks to a better expressiveness and ease of visualization of highly-connected data in a graph database. Our client is providing sophisticated tools to manage multiple projects in big organisations. This software stack was going through a lot of transformation and rapid development to cover new functionality, however using relational database started to be more and more of an issue than a help. It is not like SQL databases are wrong, it is not even about SQL - the thing is SQL is delivering a lot of functionality like constrained schema and types which are not essential to such data model, but is lacking simplicity when data is more connected – but this is where our client’s business has value, in exploring, modifying and comparing these connections. Technically, it means more and more data processing is done by application code, in memory, where database is downgraded to simple “permanent serialized storage”. While this is a usual path when scaling up - taking more and more processing from database and distributing it on application nodes - it also brings a lot of ugliness. The complex data model in application logic is far from simple structures stored in database, it is also hard to validate or cross-check data consistency. Any ad-hoc business analytics needs writing another application features (no simple database queries) – that drives up application complexity and we end up not only with more expensive development of new functionalities, but also with higher bug-fixing/quality/maintenance costs. First phase was to evaluate how such data can be expressed in a better form. At that time there were 2-3 graph database options available on the market (OrientDB and perhaps Titan), but for prototyping we choose only Neo4j. That was because Neo4j was the most mature solution for this type of data and data size, while licensing was Ok, coverage in language drivers/api/doc was also good, with quite large and active community, the used Cypher query language, somehow similar to SQL, but with a lot of functionality for connected data – all that was a promise to go with this project within acceptable risks levels and to be able to develop new features when needed. We already had some previous experience with Neo4j, so it was easy to start with. For rapid prototyping and SQL to Neo4j conversion, we decided to write ETL in Ruby with Neography. The dynamic nature of this language helped a lot with quick changes on how the data model should be transformed and stored. The goal was to have a flexible tool that can convert existing SQL databases, perhaps with some variations about the specific transformation rules depending on different data sets and customers. Neography is a REST client for Neo4j, well documented and in active development, so it was quick to start and complete with. The speed was not too essential for this task but rather proper data conversions, but still there is a room for improvement like bigger transaction blocks (batches) between commits. 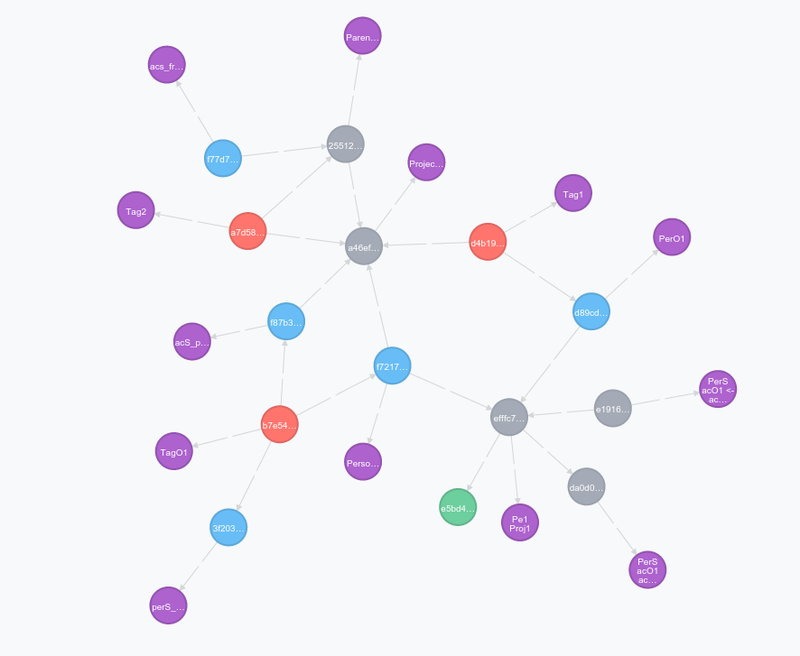 Having data converted to Neo4j, the next step was to start analyzing it with Cypher. Neo4j comes with a really nice graphical data browser and it was getting better and better between releases - it is worth to mention as a command-line shell is far from being enough when dealing not only with nodes, simple to show as an equivalent of table or key-value storage, but also with connections between nodes that can have its own set of properties and directions. but can grow to express e.g. what we want to do with returned paths, sum values or aggregate returned nodes. The business data presented in storage is expressing graph of connections and advancement of executed projects for this moment in time. There was already a functionality to keep previous changes of “node” values, but nothing like this existed for connections between them. One of the requests for new design was to cover immutability of the whole data structure - e.g. someone would like to know how the state of the overall project was looking like exactly 24 hours or 3 months ago, who changed what or do some aggregation in periods of time to see how the progress is going on. The answer was to separate mutable changes from immutable “cores”, time-stamping all the changes - where the change could be in typical data row, but also in connection. P1 and P2 are “immutable cores of data entities”. 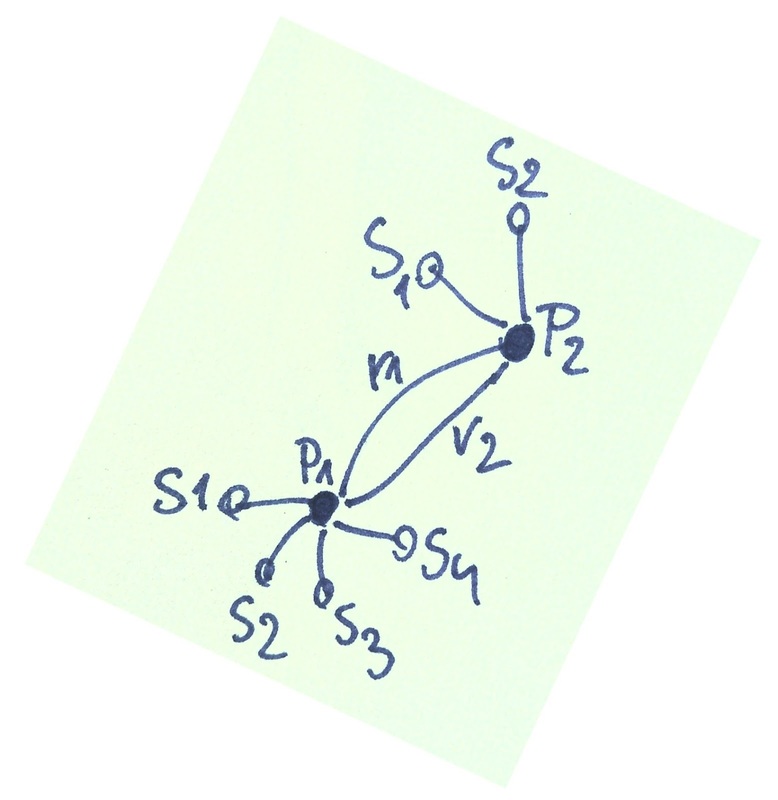 P1 got 4 changes, so they are stored as a sequence of states S1-S4. P2 got two changes S1-S2. 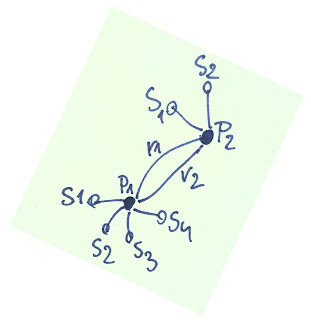 At some point of time, the properties of relation r1 connecting P1 and P2 has changed, creating another relation r2. Some of the questions that we needed to consider while modelling new structures were - how are we going to use this data, how are we going to query it, how database can help us to keep it healthy, unique or just quick to find? Neo4j has indexes, that works on data from nodes - they take node label and node property and can be constrained as a pair of unique values - similar to what we know from other databases. There are also “legacy” indexes, a bit lower-level and closer to Lucene engine, but gives us possibility to index practically any property in graph. Just by using proper indexing scheme on our data, even on small data sets we could reduce query times 10-fold. With newer versions of Neo4j, there also comes profiler and query-explain syntax to see, how possibly the query could be optimised by Neo engine and that way we have feedback on how to rebuild queries for the expected data. Our software stack is split into separate parts, with UI written in Html5/JS/Angular and backend APIs written in Scala/Play/Akka. The goal was to deliver new backend keeping UI api calls mostly intact. As the data source and “query engine” have drastically changed, it meant also some additional fiddling with returned data to get them in exactly the same way as before. Additional complexity here was coming from the fact that it is was already mimicking previous version with more SOAP-like queries, while one of the sub-goals was to introduce new simple REST calls. While developing this stack, the helpful part of Scala toolbox were type aliases (to better express already used compound structures), packing simple but specific data values into its own case classes and when the processing model was quickly changing - using implicit conversions between types to minimize impact of changes to the existing code in the first step and deliver new functionality without too much refactoring. Another story is about Scala standard collections, folds, options for optional/partial data. Also parts of Scalaz library were very helpful by giving simple operations for transforming and merging complex monoid-like data structures. I hope to write another blog post just focusing on these techniques - while such Scalaz-monoid functionalities can be found in libraries in other languages too, implicit type conversions managed in the code are not that common. The crucial part developed from the very beginning were integration tests written in BDD style, covering quickly growing complexity of the new engine and possible operations. To sum it up from higher perspective, another layer of functional tests were covering http API calls and JSON structures/transformations, with help of Scalatest. The Scala-Neo4j space does not give too much room when picking up the best library, even if some parts of Neo4j are written in Scala. Using native Java connectivity feels like too much boilerplate, FaKod library was an interesting option with its own DSL but also forcing to learn “another version of Cypher”, which could lead to a game “how I could possibly write such Cypher statement in my Cypher-like narrowed DSL”, so well-known when using some SQL/ORM-like libraries. The suitable choice seemed to be AnormCypher, allowing to execute any kind of Cypher queries, but also requiring careful quoting and parsing of returned data. It is worth to mention constant awareness of Scala-Java conversions in collection types, as they can be sometimes quite tedious to spot when “leaking” to other parts of code with quite surprising error messages. AnormCypher actually has one processing drawback, that led to problems with heap - all data read by REST client is costly transformed in-memory before being given to application. For some queries, even when the whole database was around 15MB in size, the query response data could grow 10-fold with another 10-fold to process it. I hope to find some time to help fixing it, as it was quite annoying to see JVM breaking with 3-4 GBs assigned to memory pool, while processing so little in terms of data size. But processing such data is a game with many goals - there is not so much business value in perfectly valid and complex queries, if the execution and processing time is way below expectations. Actually the solution for heap but also for speed problems was to go with hybrid data model by adding caching layer - some data is taken from Neo4j, but some additional operations are optimised/filled up by using data from cache. There are many places in data model and design, that can be improved further, especially when gathering how the data will be used and where and how quickly it will be growing. Perhaps not all changes should be kept - from time perspective, we are more sensitive about current than historical data, so old changes could be partially flattened in time-periods with the other erased to keep our storage fit. Neo4j is a quick and easy to start with but complex in its analytical possibilities tool. It can drastically simplify business logic when dealing with more connected data, giving quick tools to “see” and “touch” it. It opens new area to explore existing data, “a higher kind of abstraction”, giving similar feeling when someone compare flat files versus full SQL database with SQL queries - or when we put files modified by team of people into VCS so we can easily manage and see all changes. It is simple to write Cypher queries to prototype and develop new reports, try some new analytical things, get fresh insights. There is a hidden complexity that can sporadically appear – Neo4j approach to graph structure, graph indexing, queries with optional matches or differences between REST or write-your-own server extension. There are also some “grey” places like Neo4j simple backup, that actually creates files that cannot be directly consumed by Neo4j import tool. On the other hand - by easier manipulation, navigation and visualisation, Neo4j adds new value to existing data. Perhaps it can simplify your project-of-connected-data too?